It’s been eight years & hundreds of DIVAS later since Christina Bianco & I have done an interview together! So I’m thrilled Christina answered my call again as she gears up to make her debut at The Green Room 42! Dubbed as “The Girl with A Thousand Voices,” I got to the heart of this new show as well all the DIVALICOUSNESS we could fit in! For more on Christina visit https://www.christinabianco.com and follow her on Facebook, Twitter, Instagram, and YouTube! 1. On March 30 you are making your debut at The Green Room 42 with DIVA ON DEMAND. What made now the right time to perform at this venue? I’ve seen so many cool and diverse shows there recently and just thought it perfectly fit the vibe of this wacky show! The colorful nature of the space alone sets a playful tone and I really want the audience to be comfortable and feel like they’re part of the show. Because, this case, they are integral to it! 2. In this show, the set list is entirely made up by the audience (chosen from the multi-media menu that you and musical director Brian Nash present). What excites you about this format and what is making your nervous? Oh everything and everything! It’s truly a textbook Little Red “excited and scared” moment. I know how much audiences in person and online enjoy the little “unlikely interpretations” I do – especially when my accompanists and I try to create them on the spot. So I wanted to try applying that to an entire show. Obviously, you can’t build a well rounded, entertaining show by leaving everything up to chance, so we’re giving it some structure within the “Netflix” style parameters. Some multiple choice, fill in the blank, mix and match…with scenes and songs and diva voices. It’s a choose your own adventure show and I can’t wait to find out which adventure I’m going on! 4. Who was the first person you learned to impersonate? How long did it take you to perfect said person? I know it’s not what you wanna hear but I honestly don’t remember. I did impressions naturally as a kid, singing along to my favorites, but I didn’t take impressions seriously until Forbidden Broadway. What I can tell you is that I never think I’ve “perfected” an impression. Like anything, it takes time and practice and you grow from experience. When I listen back to old recordings of me impersonating Bernadette, Kristin or Shirley, I never like it. I can’t believe people even thought my impressions were good! Yes, I’m much more comfortable doing “the big divas” now but I’m sure in 5 years I’ll listen back to me and think I was rubbish now too! I’ll never stop pushing myself to be better. 5. Who has been the easiest person to impersonate? Who is the most challenging still to this day? I’d say Celine is fairly easy because her vocal timber and vibrato speed are very similar to that of my own. The most difficult are artists with voices very different from my own. I’m more forward and nasal so I really have to manipulate my voice to do someone like Whitney Houston – and on the other side of that I find it very hard to impersonate Dolly Parton as I have to make my voice softer and more breathy, while still supporting enough to speed up my vibrato. Also, anyone with grit in their voice is tough for me. Sadly, I know I’ll never be able to do people like Elaine Stritch or Joan Rivers. 6. Out of the people you impersonate, has anyone ever asked you to stop impersonating them? Thankfully, no one has ever asked me to stop. I hope it’s because people can tell that I do all of these impressions with nothing but love. I try to make it clear that I’m celebrating these divas and not poking fun at them, and I think that goes a long way. 7. You have been coined “The Girl of A Thousand Voices.” Who haven't you impersonated that you would like to? Sooooooo many people! Singing and speaking impressions. I’m not happy with my Tina Turner yet…I still wanna do Patti LaBelle, Betty Buckley, Jane Krakowski, Amy Poehler, Patsy Cline, Dusty Springfield…but Dusty is raspy though and there’s that issue again! It’s frustrating, but if I could sing like that then I probably wouldn’t be able to impersonate someone with a very clear voice like Kristin Chenoweth. You win some you lose some! 8. What is your creative process like in deciding which song(s) you want to perform & which singers you want to impersonate in said song(s)? Shhhhh, I can’t give away my secrets! All I can say is it starts with a huge, multi-page list, then the list gets smaller and some point after that I have post it notes all over my house and I move them around putting the show order and diva placement together. And I always choose the beginning, middle and end, first. 9. Since you impersonate so many people, if someone were to impersonate you, what are one or two characteristics they would have to get spot on to make it legit? Good question. So good I can’t even answer it. Likes so many artists, I love what I do but omg please don’t make me watch or listen to myself! Editing my album was a strange kind of torture at times! Ummm…I know I’ve got some “isms” like hitting oddly specific consonants…and I tend to scoop a lot into long held notes…I strangely only hold the mic in my right hand…Look, just have Anna Kendrick impersonate me and I’m sure I’ll be happy with whatever she does! Christina Bianco’s singular voice and comedic charm have brought audiences around the world to their feet. Christina captured international acclaim as a YouTube sensation with her “diva” impression videos, gaining over 24 million views. Dubbed ‘the girl of a thousand voices,’ Christina has performed on major television programs such as The Ellen DeGeneres Show, The Meredith Vieira Show, The Queen Latifah Show, and The Today Show, in the United States alone. A two-time Drama Desk Award nominee, Christina made her West End debut starring in The Menier Chocolate Factory’s hailed production of Forbidden Broadway at the Vaudeville Theatre in London. New York credits include The Marvelous Wonderettes; the one-woman, multi-character comedy, Application Pending (Drama Desk Award nomination); Newsical the Musical; and Forbidden Broadway: Goes To Rehab (Drama Desk Award nomination). 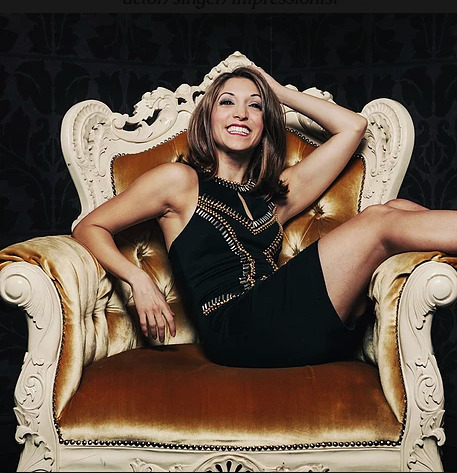 Christina Bianco, The Green Room 42, Celine Dion, Brian Nash, "Fraggle Rock", "Muppet Babies", "Animaniacs", "Pinky and the Brain…", "NEWSical The Musical", "DIVA ON DEMAND", " Forbidden Broadway: Goes To Rehab"